action of the spring. 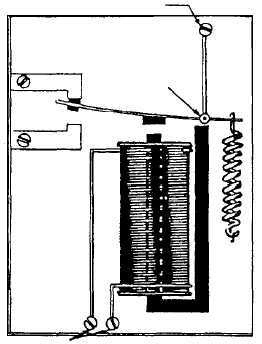 When voltage is applied, the current through the coil produces a magnetic field, which draws the plunger within the coil, thereby resulting in mechanical motion. When the coil is de-energized, the plunger returns to its normal position by the spring action. Solenoids are used in steam catapult systems for electrically operating bridle tensioning valves, lubrication valves, engine retraction valves, and relays, and for various other mechanisms where only small movements are required. One of the distinct advantages in the use of solenoids is that a mechanical movement can be accomplished at a considerable distance from the control station. The only link necessary between the control and the solenoid is the electrical wiring for the coil current. Relays One of the principal uses of relays is the remote control of circuits. Circuits may be energized by control relays from one or more stations simply by closing a switch. Switches used to energize relays require lightweight wire only, and may thereby eliminate the necessity of running heavy power cable to the various control points. An additional advantage resulting from relay control is the removal of safety hazards, since high-voltage equipment can be switched remotely without danger to the operator. In general, a relay consists of the following components: a magnetic core and associated coil, the contacts, springs, armature, and the mounting. Figure 4-52 illustrates the fundamental construction of a relay. When the circuit is energized, the flow of current through the coil creates a strong magnetic field, which pulls the armature to a position that closes the contacts. When the coil is energized, it moves the armature to contact C1, which completes the circuit from the common terminal to C1. At the same time, it has opened the circuit to contact C2. The relay is one of the most dependable electromechanical devices in use; but like any other mechanical or electrical equipment, relays occasionally wear out or become inoperative for one reason or another. Should inspection determine that a relay has exceeded its safe life, the relay should be removed immediately and replaced with one of the same type. Fuses And Circuit Breakers The electrical control system is protected from overloading by fuses and circuit breakers. 4-43 CORE PIN COIL DE-ENERGIZED PLUNGER SPRING ENERGIZED S N S ABEf0452 N Figure 4-51.Solenoid. COMMON TERMINAL PIVOT C C 2 1 RELAY COIL TERMINALS ABEf0453 Figure 4-52.Relay construction.